RidgeLine Overhead Garage Door offers a wide variety of residential garage doors manufactured by some of the best in the industry. When selecting your garage door we can show you everything from classic and traditional styles to contemporary and modern depending on what you may be looking for. Once you have chosen the perfect garage door for your home what will make this great is your garage door opener, together they make a perfect team and simplify your everyday life. The garage door opener allows for easy access to your home without having to manual lift your door when arriving home to park your car in a safe location. Austin area business owners want personalized customer service with their commercial garage doors. With many years of experience, RidgeLine Overhead Garage Door is your top choice when it comes to this. Your commercial garage door should be durable enough to withstand multiple daily uses over many years and we understand the importance of this. With frequency of use being the most common difference, commercial sites have very different needs than residential applications. The typical residential operator may be used only a few times daily, where as a Commercial Operator may be used several times in one hour. Our goal is to provide outstanding customer service along with superior workmanship and products. You can trust the experts at RidgeLine Overhead Garage Door to lend a professional and affordable solution to all of your Residential and Commercial garage door needs. At RidgeLine Overhead Garage Door we pride ourselves in the ability to present exceptional skills and expertise to all jobs we encounter. With quality service we consistently give home and business owners confidence and peace of mind each time we provide our services to you. Building trust with honest prices and sameday service while using products that stand up to the rigors of everyday life. You can rest assure we will provide you with the best option when needing service at your home or place of business. Send us your contact information, and we’ll give you a call to discuss your needs and find the right solution for you. We even offer free estimates! RidgeLine Overhead Garage Door offers a wide variety of residential garage doors manufactured by some of the best in the industry. When selecting your garage door we can show you everything from classic and traditional styles to contemporary and modern depending on what you may be looking for. We offer steel garage doors, full view garage doors (with huge garage door windows), faux wood garage doors, carriage house garage doors, and even more. 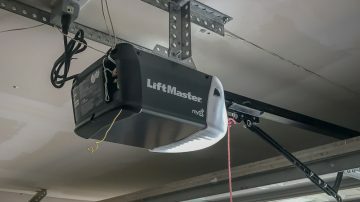 The garage door opener allows for easy access to your home without having to manual lift your door when arriving home to park your car in a safe location. Once you have chosen the perfect garage door for your home, you'll need the best garage door opener for it. With all major garage door operators in our inventory, we have the one for you. We carry belt garage door openers, chain garage door openers, jackshaft garage door openers, and screw-drive garage door openers. Austin area business owners want personalized customer service with their commercial garage doors. We can accommodate many different garage door sizes and offer garage door hardware from a wide selection of manufacturers. With many years of experience, RidgeLine is your top choice for overhead garage doors. Commercial overhead doors are used much more frequently than residential ones. In general, commercial sites have very different needs than residential applications. Our commercial garage door openers operate on a garage door track and work with garage door remotes and a garage door keypad. You can call us when your automatic gate no longer opens or shuts. We specialize in gate operator repairs and installations. We repair all brands including, Liftmaster, Door King, Linear, and All-O-Matic to name a few. Whether you're looking for a sliding gate operator or a swinging gate operator, we have options for you. Dock Bumpers are necessary to absorb the impact force of a vehicle in order to protect the loading dock when backing into it. Properly selected and installed dock bumpers can protect from as much as 100,000 lb. of impact force. Dock Seals provide a seal between the building and truck at your businesses loading dock. These dock seals are designed to fit most standard door sizes providing a tight seal against the truck for climate control and safety purposes. Dock Levelers are your bridge to your companies efficiency, productivity, and profitability. Crossing over these units will be most of your deliveries and shipments. We offer manual powered, hydraulic powered, and air-powered dock levelers. When it comes to your loading dock its easy to conclude this is likely the most hazardous area of your operation when taking into account the many possible hazards and activities that occur in this area. 16x7'6" Opening (actual Door 16x9''6") Clopay 522, Smooth Flush Panel (no grain/texture) non-insulated, white, reverse angle track, dual hinges, and perimeter weather seal. Looking for a quality and affordable service for your garage door? We are a full service garage door company providing sales, install, repair, and maintenance for all your garage door and equipment needs. As a hands-on CEO and Founder of RidgeLine Overhead Garage Door I fully understand the needs of customers and business owners and look forward to building relationships based on our core traditional values of customer service, quality craftsmanship, and integrity. It is an important decision to research when choosing a garage door service provider. At RidgeLine Overhead Garage Door we help to relieve your stress in making this decision. Your door system works to prevent moisture, wind damage, theft, loss in energy, and accidents when closing. With this being said your garage door technician, whether its residential or commercial applications, needs to be knowledgeable, dependable, trustworthy, and most importantly thorough. It is important to have your door serviced and maintained properly when you choose your garage door service company. These are all elements you can expect when choosing RidgeLine Overhead Garage Door as your provider for such work. What sets us apart from the pack is our professional attitude, fast response times, cleanliness of job sites, to our ability to help you maximize the life of your investment. When you find yourself in a situation where your garage door is not operating properly, you can expect we will always be there to take your call and respond to your needs to keep you and your door on track at all times. With our professional approach, we would enjoy the opportunity to talk to you about your new installation, maintenance, repair or replacement needs. We are here to show you what true customer service means when choosing RidgeLine Overhead Garage Door. Feel free to contact us today to get your job started with us. With every visit at your home or place of business, we provide a standardized Multi-Point Safety and Maintenance check to ensure the full potential and longevity of all your garage door parts and components. This will allow for the maximum life cycles out of each critical part of your garage door and opener, in turn saving you time and money down the road. Just like your personal vehicle, routine maintenance can extend the life of your doors, operators, hardware, and dock equipment. As well as prevent costly repairs, but also possible injuries and/or accidents to your family or personnel depending on if it's your home or place of business. I like having a garage company that shows up when they say they will, give me repair options to fit my budget and complete the work in the same visit. RidgeLine Overhead Garage Door does all that and Daryl is friendly and knowledgeable too. I'll use his services again if I need attention to my garage doors. I called RidgeLine Overhead Garage Door asking to see when they could fix my garage door spring that is broken, Daryl said he was already in the area and would come by as soon as possible. He came in 15 mins, fixed the springs in 30 minutes. He said he put in better springs than the ones we had on my garage! Great job and clean work! Daryl is personable and friendly. He is able to quickly determine what is wrong and get it fixed precisely. Good old fashioned customer service at a very reasonable price. I'd call Daryl again without hesitation! Daryl has the skill of being a great people person and also being great at his work too. For a new homeowner like me i found him honest and very helpful and thats all i could ask for. You can guarantee i will refer your service when ever possible!